In order to determine the history of the Valles Marineris, the current-day features must be noted and carefully examined, with attention paid to how they may relate to possible previous processes. 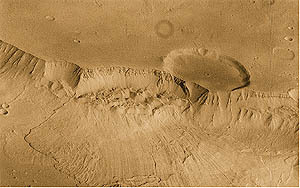 Figure 5: Mass wasting in the Valles Marineris. Evidence exists of recent geological activity, primarily in the way of mass-wasting processes, as seen in Figure 5. These along with patches of chaotic and knobby terrain are indicative of repeated, continual collapsing of wall-rock debris (Tanaka, K.L, 1997). Images from other parts of the Valles Marineris show that surface outflow channels are apparent and connect most of the canyons (Figure 4) (Tanaka, K.L., 1997). Eastward-heading debris flows are also observed covering parts of Ius and Coprates Chasma (Hauber, E., 2000). Additionally, it can be seen that floor material from the Coprates, Melas and Candor chasmata are relatively flat with a moderate crater density. Orbital observations also show that Melas Chasma has thin eolian deposits. 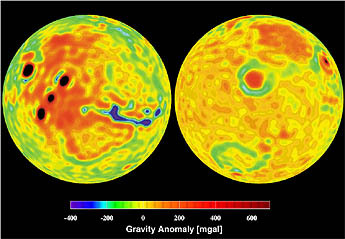 Using non-optical instruments, Mars Global Surveyor has made detailed gravity maps of Mars, which under analysis, show an obvious negative gravity anomaly at the Valles Marineris (Figure 6). This data coupled with altimeter readings from the MOLA tend to indicate crustal thinning due to lithospheric stretching (Hauber, E., 2000). 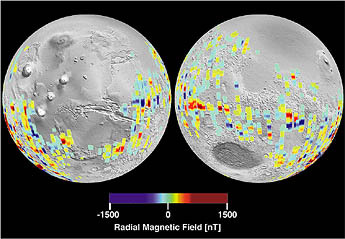 Magnetic field observations are outlined on a planetary scale in Figure 7. The research discerning the geology of modern-day Valles Marineris has made several key findings. Dark deposits are common throughout the troughs and can possibly be associated with volcanic vents (Lucchitta, B.K., 2002), although for unknown reasons these deposits are "geochemically depleted" when compared to other Martian volcanics (Scott, E.D., 2000). The process of distinguishing contact relations between trough walls and the floor proved difficult in Malin and Edgett's (2000) study of Martian sedimentary rocks, since most of the floor contacts the wall with these dark-deposit volcanic materials. Another significant feature seen in the Valles Marineris are Interior Layered Deposits (ILDs). The nature of these mesas is not readily apparent, although some researchers believe they are volcanic in origin (Lucchitta, B.K., 2002), and that they are definitely younger than floor areas without dark deposits (Malin, M.C. and Edgett, K.S., 2000). In a 2001 study by Christensen, P.R. et al attempting to map possible water outflow regions, the global mapping of Mars for the mineral hematite revealed significantly elevated levels of iron oxides in localized areas of the Valles Marineris floor. They noticed that they were related with the same dark deposits observed by Lucchitta, Malin and Scott, and that no hematite-rich materials were evident in areas that did not have ILDs (e.g., Ius Chasma and Coprates Chasma). Tanaka (1997) noted that Martian crust is mostly made up of poorly consolidated material and easily triggered by nearby seismic or volcanic events. This may have served a role in the Valles Marineris' creation if either of these types of events were present. The outcroppings observed in the Valles Marineris are very continuous and invariable over larger distances. Indeed, the rock sequences in this area are similar to those found in craters of western Arabia Terra (and elsewhere) (Malin, M.C. and Edgett, K.S., 2000). Extensive fault systems are present around the Valles Marineris (Schultz, R.A., 1991), radiating outwards from the Tharsis region to extend parallel to the trough systems. Grabens are prevalent throughout the canyon system, and those structures observed in Coprates Chasma point to scenarios analogous to continental rifting on Earth, indicating rifting of the Martian lithosphere (Schultz, R.A., 1991).